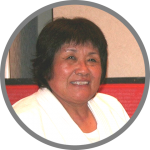 Ann Maria began judo at the age of 12 years old at Alton YMCA in Alton, Illinois. She trained for a year at Waseda University in Japan, and for a few years at both Tenri Dojo in Los Angeles and the Naval Club in San Diego. She is currently president and co-founder of 7 Generation Games, a software company that makes adventure games that teach math and English. She is also an instructor in the Gompers Middle School Judo Club in South Los Angeles. Dr. De Mars has a BSBA from Washington University in St. Louis, MBA from the University of Minnesota and M.A, and PhD from the University of California. She is the mother of four daughters, including Olympic medalist and UFC star Ronda Rousey, and New York Times best selling author, Maria Bums Ortiz.